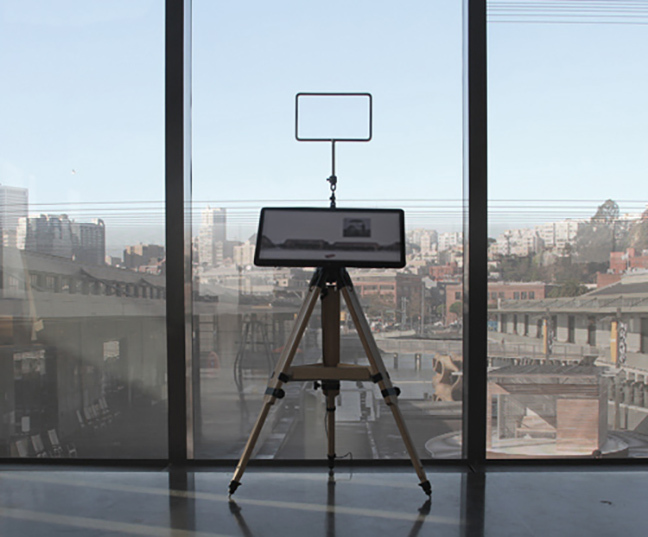 Touch screen survey instrument for observing the brick warehouse architecture of San Francisco's Northeast Waterfront Historic District as anthrogeological rock formations. Drawing on the plane table survey instruments used in the geological exploration of the American West, the interface maps quoins, pilasters, arches, entablatures, and other features of historic brick architecture as forms of human-mediated sedimentary layering in the biogenic urban geology of the neighborhood. Nineteenth century brick warehouse buildings visible from the Bay Observatory geotechture observation station photomerged with the shale quarry landscape of the Remillard Greenbrae brickyard in Marin County, The Hoffman kiln complex at the Remillard yard produced bricks used in many of the prominent buildings in San Francisco and Oakland from 1891 to 1915.